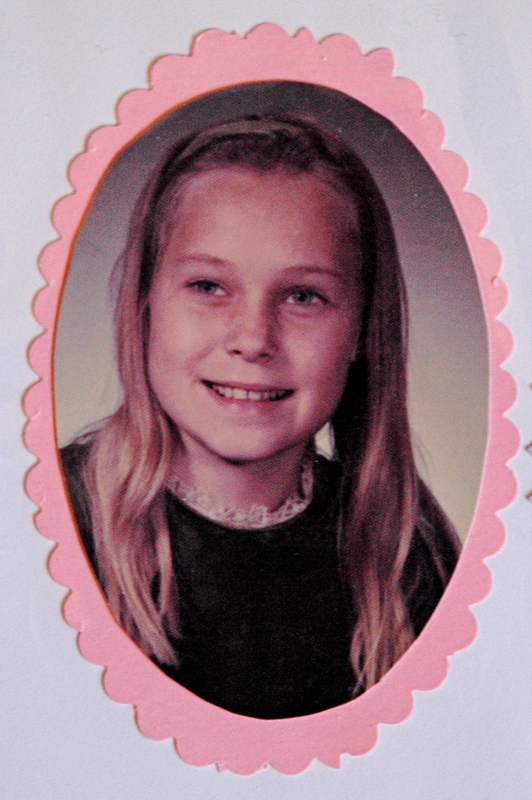 1972–I wanted to look like Lori Partridge, but my teacher thought I looked like a Spanish orphan. I’ve been thinking about how we become the people we are. Becoming is a theme I like to explore… I wrote a memoir about becoming a writer. And I’m always becoming something new. These days I’m working on becoming someone who understands multiple languages (or tries to). I wonder where and how my fascination with languages started. I didn’t grow up in a multi-linguistic environment. Maybe it began when in Kindergarten, my Sunday School Teacher taught us to sing “I’ve got the joy-joy-joy-joy down in my heart” in Chinese. I felt very clever. I like feeling clever. Okay, so she only taught us a few of the words in Chinese. And then, in third grade I, a child of 100% German-Lutheran heritage, became a Spanish orphan, when my school put on an operetta. Of course. The Man with the Crooked Nose! But by then I knew it wasn’t that easy for people to get over their differences, especially when only in operettas do people from all those different countries speak the same language. Maybe that’s how I became someone who always wants to learn another language. I think language-learning is important for understanding, which is important for peace. And maybe you’ve figured out that this post is introducing a new series for my blog–language learning, why and how. What’s your second language? (or third or fourth?) Or which one would you like to speak? Great post. There is something about the rhythm of words that speak even when we don’t understand them. But it’s imp to remember that that’s how far it goes. Sometimes, our misunderstandings of other languages are hilarious, sometimes damaging. Yes, it isn’t easy for people to get over their differences. Perhaps it’s not always desirable to do so? A very sensitive post. Hi B.W.–I’ve been peeking in at your blog for almost a year now. Thanks for visiting and commenting. I would rather not think about the complexities of the world–things were so much easier after all when I was a Spanish orphan. Muy interesante! I speak Spanish but tried to learn German and French from my kids when they took those courses in high school. You’re love for words is infectious. Thank you, Sylvia–that’s what I hope. Because you know where my love for the word really comes from, and it ought to be infectious, or it’s not worth much. I speak German fluently, and am working on French and Hebrew right now. Spanish is on my list as my next language. I’m hoping to dig into it next year. My brother (in his 40’s) is doing very well learning it. I’m really proud of him, and that’s one of the reasons this series is dear to my heart. First of all, thanks for the deep chuckle I got when I found out your Chinese wasn’t quite as Chinese as you thought. I remember most of the operettas we put on, too. I thought I was quite an actor! The German I learned in high school has mostly left my pea-sized brain, but once in a while I can recall a word or two. I’ve learned American Sign Language in bits and pieces, but wish I could learn more. I keep yearning to learn Spanish and will force myself to step outside my comfort zone to do so….some day. Meanwhile, I will take great joy from reading your words of wit and wisdom. Thank you my friend. You’re so kind. And thanks for commenting, because sometimes I feel like I’m writing into deep space (or talking to a wall) and I wonder whether nobody is reading? But lately I’ve begun to get feedback, and know that people are actually reading, and enjoying, my blog–which keeps me writing it. Let’s maybe learn Spanish together some day next year! It would be fun! Sylvia could help us, I’m sure. You know I speak a few more languages, but it is not about ticking them off a list. It is about being able to communicate without a barrier or an inbuilt blocker which is translation. Just like travelling for me is more than being at a beach, it is about being and living in a culture, language helps me fully arrive. I forgot to tell you–my German tandem-partner’s son just had a French exchange student, and next year he gets thrown off the bus in France. I wish we did more of that kind of thing here. And I so agree with you–traveling isn’t about mere fun and entertainment, it’s about getting to know the wider world. And language is a tool for that. But now, thanks to you, I have peesah-passah-kooki-mahcki down in my heart…. Peesah-passah is the best thing for opening up the mind to language-learning, once we grasp a child-like capacity for enjoying it, playing with words, it becomes as natural as laughter…. Watch Spanish cartoons aimed at preschoolers, if you can. You’ll be surprised how much comes back to you, (despite the poor teaching, which was likely a bunch of grammar drills I’m guessing) how quickly you’ll find a door into the language. I think it CAN, Tracy. A word voiced from the heart is a prayer and carries the energy of actualization within its sounding – so all together now, Friede, Paix, Paz, Shalom and every other language on the planet! I agree dear friend! A word voiced from the heart is a prayer. I was hoping people would answer that question in the affirmative! Greedy for words! Love! My second language is cat. But my third language is French, that I was forced to take in college like it was my job. Twelve hours a week for two years, with 85% of my grade resting on my oral final. The horror! Fabulous post, my friend! I’m always amazed and surprised at how many people know a number of language. (But you’re the only one I know who speaks cat.) Do you ever get an opportunity to use French? Imagine that? I’m the only person you know who speaks cat? Go figure! 🙂 I never get to use my French except for the random high school kid who needs a little practice – and to say that I’m rusty with the language is being nice since I don’t get to speak it very often! As you know, use-it-or-lose it applies to languages. After 20 years of not speaking it, I totally lost the German I had once been completely fluent in. I now watch German television shows on line, and correspond with some German pen pals at least once a week, and read a German magazine/newspaper a few times a week. Takes about 2-3 hours of my life, each week. The payback is that I’m fluent again. Ha! I don’t know how to do anything other than a normal smiley, either! What a wonderful opportunity for them. I have a friend who teaches at an immersion school in Minnesota–math and science. And it’s amazing. I know a number of families whose children are bilingual, and it often gives those kids an edge when they go to apply for college & jobs. But more importantly, those children have a self-assurance about them. They know they’re citizens of the world. I also like that they’d keep the same classmates for a number of years. I think one of the best things that happened in my childhood was the stability of having a consistent set of classmates. Fantastic post Tracy! I started learning French in high school, became fluent while studying abroad in college and honed my skills leading bike trips there after college. We started both of our boys early–in the French International School in Philadelphia. My ten year-old is now fluent and our four year-old is on his way. More than anything else, I notice that they have a better sense of “other” than I ever did. They have a greater sense of the world and the people who inhabit it. I am thrilled that they have a wider experience and can’t wait to see how it develops…. Yea for you! I wish I had raised my children bi-lingual. I spoke German often to them when they were small, but there was no immersion school and absolutely NO ONE else ever spoke German to them, so as they got older, it made them SO angry when I talked it. But they could understand it, the little rats, and surprisingly, can still understand it a little. They don’t however speak it.